Save your receipts and send them in with your Everyday Rebate Rewards Form and receive 10% cash back. 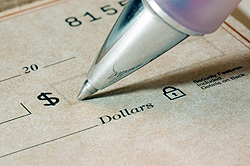 We will reimburse you up to $10 per quarter. Increase your Scheduled Airline Insurance to $50,000, and increase your Accidental Death to $20,000. Keep vital health and personal data on hand at all times on your Medical card. You can update your card every year.